Consists of a massive 2.5mm solid brushed aluminum body with diamond-cut edges and entangled by a solid 0.6mm steel mesh, the look and feel of the Caesar is astonishing. 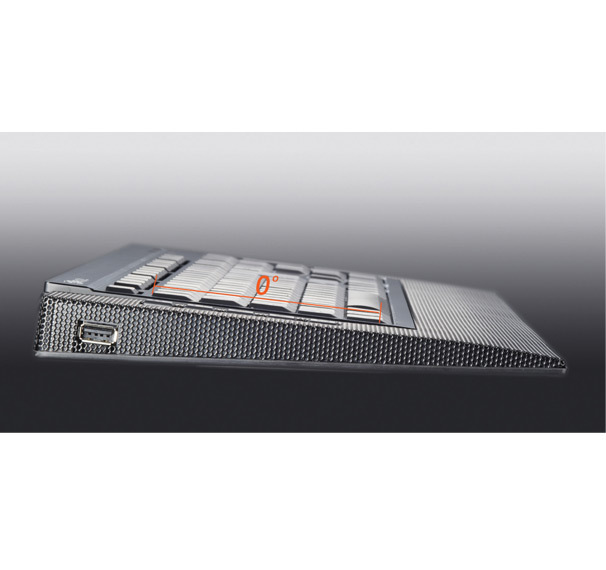 With patented Scissors key switch technology, Caesar is ideal for users who akin to products with unique design and appearance, or someone who prefer “notebook-alike” key switch. Caesar comes with two built-in USB 2.0 ports as well as a built-in audio I/O chip which gives user easy access to their microphone, headsets or VoIP phone. The Windows Vistatm certified Caesar comes with 5 integrated hotkeys for Windows Vistatm - Mail, Search, Flip 3D, Gadgets and Media Center functions, and 5 Media Hot keys for Play/Pause, Stop, Volume up, Volume down and Mute. A solid and steady body of 3.2 lbs with three different height adjustments, and extended wrist rest for user comforts, Caesar is truly the “Emperor of Keyboards”.